The present site, acquired from Mr. Clack in 1949, and conveniently situated on the Swindon Road, was previously part of a field that had been used for the grazing of livestock. It seems that pigs were prominent among the animals, and rumour has it that some of the peculiarities shown by parts of the green (in particular that part nearest the Swindon Road) are attributable to the rooting and other activities of pigs in the distant past. To what extent this is true is debatable. In early 1950, the purchase of the land was confirmed and the stage was set to proceed with the development of the site. The area needed for the green had to be prepared, levelled and either turfed or sown with grass. An access from the Swindon Road was an urgent necessity. The boundary between the site and the road formed a continuous verge with a ditch, which would need to be covered before there could be ready access to the site. Funds were obviously going to be a problem. These were found partly from interest free loans from members, partly from social activities and partly from monies raised from the sale of lottery tickets at some of the works in the area, notably Vickers. A Mr. Gosling of Stratton was invited to discuss with the committee the construction of the new green, and to submit estimates. These amounted to £340 for clearing and preparing the site, and £640 for completing the job by laying down turf, which came from an area near Marlborough (Broad Hinton). Suttons gave a quotation of £50 for seeding a prepared site. As the laying of turf would enable the green to be used a year earlier than if the site was seeded, it was decided to accept the quotation of £640 from Mr. Gosling. 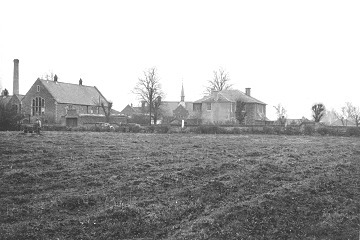 Fred Richardson took on the task of preparing plans for the development of the site and seeking approval from the Parish Council for permission to lay the green and make an access road. His activities also extended to undertaking the duties of assistant secretary to Mr. Clack, who needed help because of the additional work arising from the development of the site. 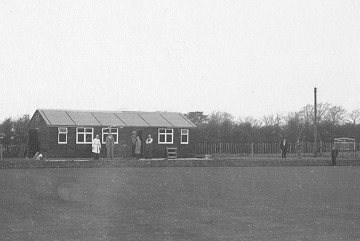 The club continued to play bowls in the recreation ground for season 1950. 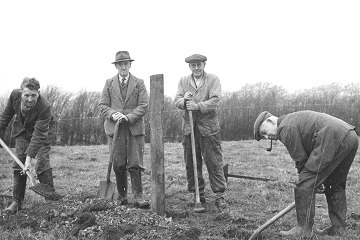 By June 1950 the club had become concerned at the lack of progress in the construction of the green, and some delegated members met Mr. Gosling in an endeavour to get things speeded up. This he promised to do. When the area set aside for the construction of the green was pegged out, it was found to be out of square. When this was brought to the attention of Mr. Clack, he helpfully offered to extend the rear boundary to allow the irregularity to be corrected, provided the club relinquished a similar amount of ground at the front of the site. This offer was accepted with gratitude by the club. At the Annual General Meeting in October 1950, Ted Drew became President, Ted Matthews Chairman, Fred Richardson Secretary, A. Hull Treasurer, and E.G. Woodbridge Captain. Tribute was paid to the great help given by the ladies in the various social and fund raising activities of the club, and it was agreed to apply for entrance to the Wiltshire league for the 1951 season. It was decided that during the construction of the green, privet should be planted and chestnut paling erected as a surround. However, progress on the preparation of the green remained pitifully slow, and in early 1951 Mr. Gosling was again pressed for more action. Regretfully, this had little effect and in early 1952 the arrangement was terminated on payment of £60 to him as compensation. This left club members with the task of completing the laying of the green by their own efforts. As the green was under construction, enquiries were being made with a view to acquiring a building suitable for use as a pavilion. Eventually the War Department was approached and it transpired that two huts, formerly used by men of the Pioneer Corps, were available at a location in Stanton Fitzwarren. The huts were at the time occupied by squatters, for whom the council were about to provide other accommodation. The War Department gave the club the choice of either hut for £50, provided the chosen hut was taken down and removed on the night the squatters moved to their new accommodation, to prevent new squatters taking possession. The club accepted this arrangement and on the evening in question a convoy consisting of Ted Drew with one of his older buses, and a tractor and trailer driven by Fred Wood, proceeded to Stanton Fitzwarren, to dismantle and remove the hut, with the help of other members. Report has it that they not only acquired a hut but also various other items including concrete slabs and an electricity pylon. So the first club pavilion was acquired and erected on site. In early 1952, consideration was given to admitting ladies as full playing members. A decision on this was postponed. In the event, an affirmative decision on this was not reached until 1955. Meantime, some of the ladies, not to be outdone, played on the Stratton green. But it should be remembered that playing membership at this time was quite low, totalling around 30. The newly acquired hut provided only limited space and to meet the needs of the ladies, a tool shed was purchased and an Elsan lavatory installed for their exclusive use. A cabin was subsequently acquired and added to the town end of the pavilion, for use as a ladies’ changing room. A grant was sought towards the cost of this cabin, which initially was unfurnished. An official visited the club on two or three occasions in connection with this application and eventually offered a grant of £20, conditional on seeing the cabin furnished for use. Following an appeal to Geoff Gleed of Blunsdon, he sent over sufficient furnishings to satisfy requirements. When the cabin had been duly inspected and the £20 in hand, the furnishings promptly made their way back to Blunsdon. The activities of the ladies had been largely confined to the social side of the club’s activities, but after being accepted as playing members, efforts were made to arrange fixtures for them with the ladies’ sections of other bowls clubs. But it proved difficult in the early stages to arrange enough fixtures for them. The first annual dinner and prize-giving of the club was held in January 1955. Tickets cost 7 shillings, which left a small profit for the club. The finances of the club had now reached a sufficiently healthy state to allow all outstanding loans to be repaid. Because of the lack of fixtures for the ladies, a major change was introduced for their benefit, with the introduction of mixed friendly matches, or the provision of one or more separate rinks for ladies only. Around this time maintenance of the green became the responsibility of Ted Drew, and remained so for many years. Other club members assisted as and when the state of the green required. The period that followed was one of slow but continuous development. The pavilion was extended in 1958 to provide space for a kitchen and committee room. An additional strip of land was purchased at the rear of the pavilion, and the first blazer badge was designed and became available to members. Indoor bowls was becoming popular, and in 1958 the club played its first match on an indoor green at Banbury. Meanwhile, the management continued to think of long term needs, and a ‘New Building Fund’ was set up, the monies raised being put aside in a deposit account. The first consideration was for new toilets. The green had reached a sufficient state of excellence for a representative match to be played in 1963, and such matches became a regular feature on the green during the following years. The club was honoured in 1963-64 by the election of F. G. Gleed as President of the Swindon & District Bowls Association. By 1967 the finances of the club were in sufficiently good health to enable the last of the mortgage on the site to be repaid to Mr. Clack. During 1963-69 the Ladies’ Section, encouraged by the then club president F. G. Gleed, became more formal in its organisation, by appointing officers and a committee, and recording minutes. The club, originally called the Highworth Bowling Club, changed its name to the Highworth Bowls Club. The club rules, which had stood virtually unchanged since 1936, were revised in 1970, together with the rules governing club competitions. The Ladies’ Section, now stronger with 18 members, became more active and formed an entertainments committee to assist in fund raising. Club members were winning honours for themselves and the club. Mrs. R. Bond won the Wilts. Ladies’ Singles Championship and Messrs. Moulding, Gleed, Panting and Woodbridge the Wiltshire Rinks Championship. In early 1973 it was decided that the club pavilion, which had served the club since 1951, had outlived its usefulness, despite the additions and improvements made to it over the years. The General Committee, now designated the Management Committee, appointed a sub-committee to consider the matter. The proposal to replace the existing pavilion met with the approval of members, so much so that one generous member contributed £50 to a building fund, and the sisters of a deceased member, Reg Plumb, made a donation of £100. With their approval, this sum was used to increase the size of the bar and a plaque in memory of Reg Plumb is affixed to the bar, both in recognition of the gift and also as a tribute to him as a good and helpful club member. The Club suffered a grievous loss during 1973 when Ted Drew, who had served the club so well for approaching 40 years, retired as a groundsman. His place was taken by E. Panting. A signal honour fell to the club during the same year when Mr and Mrs. Geoff Gleed were elected to serve as Presidents of the Wiltshire County Men’s and Ladies’ Bowls Association respectively. In recognition of this honour, two engraved wooden seats were purchased and suitably located on one of the banks of the green. By December 1973 a draft plan for a new building had been prepared, favouring a sectional type of construction which could be added to as needed in the future. Several firms were approached for estimates, some of which proved to be beyond the club’s resources. The committee eventually favoured a quotation of around £5000 for a building consisting of two sections, to serve as pavilion and bar, the club to be responsible for the provision of the foundations. Application was made for planning permission and was granted. The final decision to proceed with the purchase and erection of a new pavilion was taken by the Management Committee in November 1974. Plans and estimates received from the contractors gave the cost as £5,800. It was thought that with possible grants or loans from the Club’s brewers, the Council, and the Playing Fields Association, the cost to the club would not amount to much more than £2000. Estimates of £850 from Mr Clack to lay the foundations and one from Mr Gould of £100 to demolish the existing pavilion building were accepted. In the event, the final price of the building was £6070, towards which the Wiltshire County Council contributed £3,200. A donation was also received from the National Playing Fields Association, and club members made interest free loans amounting to £1,650. Once the negotiations for the new pavilion had been completed progress was swift, so much so that an official opening, before invited guests, took place on Saturday, 20th September 1975. The opening ceremony was carried out by the club president, Mr A. Burke-Jones, supported by the chairman, Mr G. Lees and the committee members. A suitably inscribed plaque was erected in the pavilion to mark the occasion. The opening was followed by a President’s vs. Captain’s match. Despite the acquisition of the new pavilion there was still room for improvement in the facilities available, particularly in the provision of changing rooms and toilet facilities. In 1980 the sub-committee formed to consider the situation produced plans for an extension estimated to cost around £6,000. The report was accepted and planning permission sought. A major problem was to find the money to pay for it, and a fund-raising committee was appointed to consider the means of doing so. Help was forthcoming from the club’s brewers, who offered a loan of £5,000, the interest payable to depend on the number of barrels of beer sold over the bar – the more barrels sold the less the rate of interest. Club members were invited to make contributions towards the cost, and applications were made to various sports bodies for grants in aid. In a time of inflation, the original estimate of cost proved to be too low. It rose rapidly to around £10,000. But the money was found, through the £5000 loan from the brewers, donations or loans amounting to £1,350 from members and sports bodies. By the end of 1981 the shell of the new extension was completed. Many of the tasks of painting, plumbing and installing electricity were undertaken by club members and completed in time for an official opening on 8th May, 1982. In the event, the total cost worked out at £7,918. The extension provided a changing room and toilets for ladies and similar facilities for men – a long way removed from the days when the ladies had to be content with an Elsan lavatory. During the official opening a memorial plaque to Ron Pearson, a former respected member and club officer, was hung in the pavilion and a memorial seat placed on one of the banks of the green. The club suffered a sad loss in 1975 through the death of Geoff Gleed, a former President and Captain of the club, who had also served a term as President of the Wiltshire County Bowls Association. In 1978 the Geoff Gleed Memorial Gala Day was introduced in his memory. The annual Gala Day takes the form of a rinks competition, in which other clubs are invited to take part, the winning rink holding the Geoff Gleed Memorial Shield for one year. The Shield was kindly donated by Mrs Gleed. Club members were again saddened in 1977 by the death of Ted Drew, who had served the club in one capacity or other for some 37 years. A year or so before his death he had been made an honorary life member in recognition of his outstanding service. Later, in 1979, the Ted Drew Memorial Gala Day was introduced as an annual event.